Savvy Food Storage #Infographic ~ Visualistan '+g+"
Do you know why you are supposed to store potatoes and onions separately? When potatoes are exposed to anything that produces ethylene gas they sprout, which seriously decreases their shelf life. Instead they should be stored in a brown paper bag in a cool dark spot in your pantry. The average family of four can waste as much as $2300 worth of food annually, but taking small steps to store foods properly can drastically cut down on waste. Separating ethylene producers from ethylene sensitive foods, both in the refrigerator and in the pantry, is one of the easiest ways to cut down on waste. It’s also important to separate foods that will be cooked from foods that will not be cooked so there’s no bacterial contamination. And milk should never go in the door of your refrigerator- that’s a spot reserved for pickles and jam. 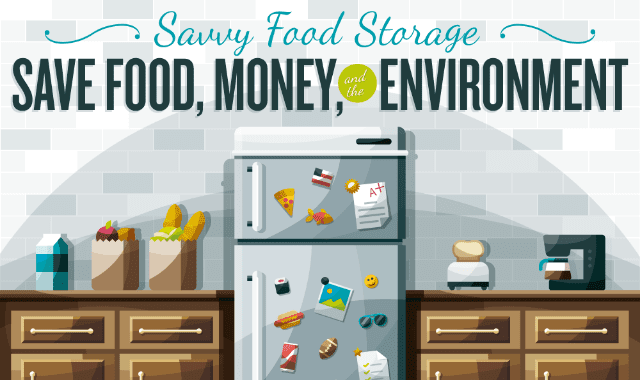 Learn more about proper food storage in your refrigerator and in your pantry from this infographic!